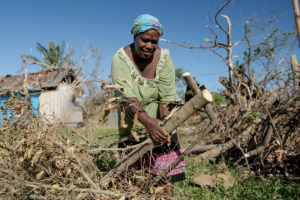 Before Cyclone Pam struck Vanuatu in March 2015, Mary Jack helped neighbors on her home island of Tanna reinforce roofs with panaudu leaves and sandbags. But the cyclone turned out to be one of the strongest storms ever to make landfall with winds upwards of 150 miles an hour and left 70 percent of Vanuatu’s 277,000 population displaced. In a country where women are discouraged from serving in parliament because of their role in the household, the women and girls of Vanuatu, a small South Pacific island nation, lack a political voice and their concerns largely go unaddressed. After the cyclone, Jack was determined to give women a space to participate in disaster management and launched Women I Tok Tok Toketa, or Women Talk Together, a forum with more than 4,000 women dedicated to women’s rights in disaster relief. Jack is one of countless women who are first responders to humanitarian crises, helping families and communities to survive. But what often prepares women to become first responders – their traditional roles as caregivers – is a cultural hurdle that keeps them in non-decision making roles. Jack, who was nominated to run for parliament, experienced this firsthand. 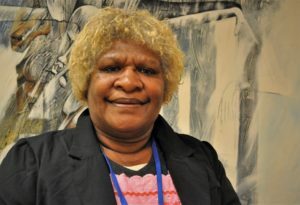 According to the UN, as of August 2015 only 22 percent of national parliamentarians worldwide were women – a figure Jack was unable to enhance. During her candidacy she faced entrenched opposition from male chiefs and relentless discrimination on the campaign trail – from men and women alike – because of the engrained belief that a women’s role is in the home. As caregivers women are in the position to advise NGOs on health care services, water, food and sanitation. But according to Oxfam, humanitarian response often fails to appreciate the importance of women’s existing roles and their capacity as leaders in emergency response. “Informally, we are humanitarian actors, however, the platform and the recognition has not been given to us,” said Joyce Kilipo, founder and executive director of Public Health Initiative Liberia, a local public health institution that works to educate communities on health issues such as Ebola. Before the Ebola outbreak, Kilipo was working with women to help curb the nation’s high maternal mortality rate. As the virus spread across the country, women began contacting Kilipo with a dilemma: how do they take care of their sick children and relatives when they’ve been told not to touch the infected? 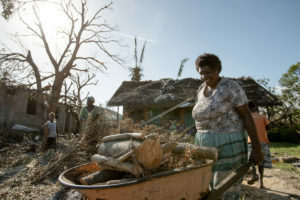 Talita Kitawi cleaning on the island of Tanna, Vanuatu, after Cyclone Pam. [left]Kilipo quickly gathered latex gloves, surgical masks and reached out to the NGO, Action Aid Liberia, which was able to provide resources and help Kilipo engage with 119 communities in four counties. As the network of women Kilipo was working with expanded, she was able to establish an Ebola community engagement task force that was crucial to curbing the spread of the virus. 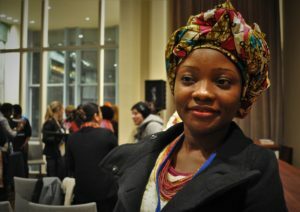 The women spoke on a panel discussion in March on women’s roles in emergency response at the UN’s 60th session of the Commission of the Status of Women, where the focus was not only on the roles that women play in humanitarian action and the barriers they face, but emphasized their importance in post-crisis recovery. Of the 80 million people in need of humanitarian assistance in 2014, more than 75 percent were women and children according to the UN. To ensure that the needs of women and girls are appropriately addressed, Kyung-wha Kang, OCHA’s assistant secretary-general and deputy emergency relief coordinator, stressed the importance of advocating for support and resources so women can continue to make lasting impacts in humanitarian response. Jenny Iamei, cleaning up after the cyclone, in Tanna, Vanuatu.